Staff Photo by Dan Henry / The Chattanooga Times Free Press- 7/12/16. Bassam Issa, President of the Islamic Center of Greater Chattanooga, stands in the mosque on Tuesday, July 12, 2016. 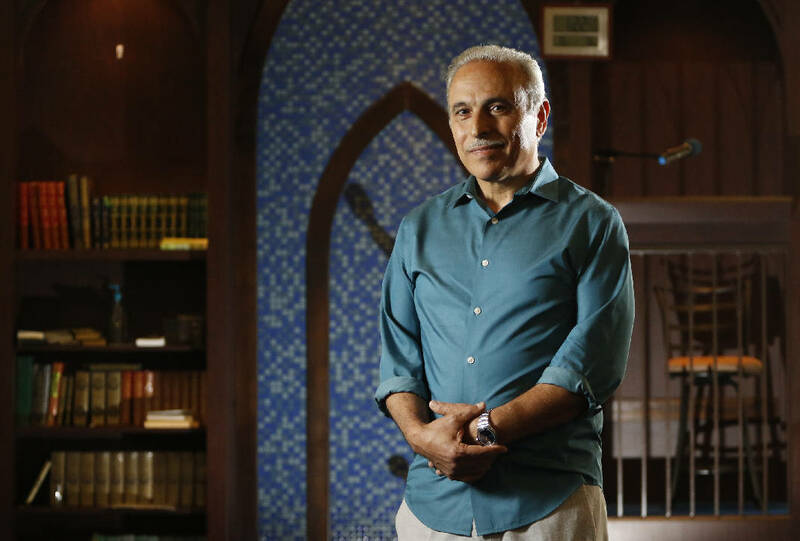 For years, Bassam Issa, the president of the Islamic Society of Greater Chattanooga, has been adamant that Muslims are just like other Americans. People of other faiths would be surprised by what common ground they share with the Muslim community, he said. "Really, the common is far more than the differences, even if the differences, as small as they are, may be fundamental," he said. "You shall not kill. You shall take care of your neighbor. They believe in the same thing." But a year ago, a Muslim man from Hixson, radicalized online, did kill. On July 16, Mohammad Youssef Abdulazeez, 24, attacked two military facilities in Chattanooga and shot to death five service members. FBI investigators work the scene of the July, 16 shooting at the Naval Operational Support Center on Amnicola Highway on Saturday, July 18, 2015, in Chattanooga, Tenn. U.S. Navy Petty Officer Randall Smith died Saturday from wounds sustained when gunman Mohammad Youssef Abdulazeez shot and killed four U.S. Marines and wounded two others and a Chattanooga police officer at the Naval Operational Support Center shortly after firing into the Armed Forces Career Center on Lee Highway. Shortly after the shooting, Issa told the Times Free Press that Abdulazeez's own father called Issa to say he knew his son had put the Muslim community in great jeopardy, and he was sorry for what his son did. In the days after the shooting, there were a few displays of anger toward Muslims. A woman on the Walnut Street Bridge held a sign that read "Ship out Arabs." A few people stood outside of a local mosque with a sign that stated, "This religion and this building offends me." Social media comments criticized Islam as a violent religion. And Louisiana Gov. Bobby Jindal, a presidential candidate at the time, said the Chattanooga shooting "underscores the grave reality of the threat posed to us by radical Islamic terrorism." Issa said he has been working with his fellow Muslims since the shooting to help clear up misconceptions about Islam. "You reach out to defuse situations and make sure as many people as possible in the surrounding area and the city you're in do understand the facts," he said. "Once you've done that, you put your faith in the creator." According to him, the actions of a few troubled men are not supported by the beliefs of the 1.6 billion Muslims worldwide or the more than 2,000 Muslims who call Chattanooga home. "It's very clear in Islam that taking a life is a sin," Issa said. But many Americans are still vehemently opposed to Islam, and in the wake of the July 16 attacks and others in San Bernardino, Calif.; Orlando, Fla., and overseas, they have decided the faith is fundamentally violent. Dr. Amos Taj, a retired Methodist minister, said the problem lies in the faith itself and the message it preaches — a message that encourages the kind of attacks experienced in Chattanooga. "Historically, Islam is a violent religion. Jihad is one of the six tenets of Islam," he said. Taj said Islam has revealed its true nature time and again in the U.S. and abroad through terrorist attacks, but Muslims spin the situation to suit their own agenda. "Every time that the person who does this is a Muslim, the Muslim organization begins to defend themselves and say, 'He's not one of us,'" he said. "From the beginning, they have always been violent." Dr. Jessica Auchter, a political science and public service professor at UTC, disagrees, arguing that religious extremism is not the primary reason people commit acts of terror. "Ultimately, recent studies of terrorism show us that there is no definitive link between Islam and terrorism," she said. "In fact, especially for home-grown Islamic terrorism, someone's personal vulnerabilities are more likely to lead to recruitment, which we have seen in some of the studies of Americans and Europeans who have joined ISIS in Syria and Iraq," she said. Further, she said, the American public's perception of the dangers presented by domestic terrorism is dramatically skewed. "The point here is that you are still more likely to be struck by lightning or drown in a bathtub or die in a car accident than be a victim of a terrorist attack in the U.S.," she said. However unlikely, Chattanooga did suffer an act of domestic terrorism. Auchter said the Muslim community has openly and consistently rejected violence. "Many moderate Muslims around the world, including our own Chattanooga Islamic community, are speaking out against Islamic terrorism," she said. "I hope that the memory of the shootings can bring the community together rather than divide it." Issa agreed with that sentiment and said one of the worst possible responses a community could have would be to allow itself to be split by religion or politics. "If one of the group members caused the problem, we all need to look at the problem as Americans and be united. Not start pointing fingers and say, 'these Muslims' or 'these blacks' or 'these policemen,'" he said. "If we do that, we are tearing America apart." Aside from the few displays of anger directed at Muslims after the shootings, Chattanoogans have been exemplary in their treatment of the Muslim community, according to Issa. In fact, he said, in this predominantly Christain environment, people chose to learn more about Islam by asking for more information. "The silver lining is it brought a lot of questions from non-Muslims to Muslims," he said. "A lot of misconceptions have been cleared up." Dr. Azhar Sheikh, a practitioner of internal medicine who worships at the Islamic Center of Greater Chattanooga, said he got to experience that firsthand in the days after the attack and was touched by the efforts of some Chattanoogans who chose to be kind instead of to hate. "I was amazed," he said. "The very next day in our mosque, there was a group of Americans who came to the mosque with their kids and they said, 'Look, we're here to show our kids that we are not afraid of you. We consider you a part of our community.'" Sheikh, who moved to America from Pakistan in 1992, said he appreciates the community and hasn't experienced any insults or attacks for being a Muslim in Southeast Tennessee. He said he's been pleased with the Chattanooga community's treatment of its Muslim members and considers himself blessed to raise a family here. "We are part of this community. We have a daughter who goes to school in Chattanooga. For her, this is home," he said. "We are fathers, husbands, brothers. Basically, our day typically begins like any other American's day. We get up, we go to work. I take care of patients. Spend some time with the family. My day, on average, is no different." On a recent Friday afternoon, in the last week of the Islamic holy month of Ramadan, which ran from June 5 to July 5, close to 200 men, women and children gathered as they do every Friday to pray at their mosque. Stashing their shoes in small cubbies outside the prayer hall, they drifted in to join friends and family who had already begun to pray. In the central room, teenage boys and men lined themselves in rows along intricately designed red lines in the plush, blue carpet to face Mecca, the birthplace of Muhammad and the holiest city in the religion of Islam. The women did the same in adjoining rooms, separated by a thin screen. The imam for this service, Hammad El-Ameen, spoke about the end of Ramadan. He told worshippers Allah commands them to control sinful desires while working to live in self-sacrifice for others. "It is a tough and bitter pill to swallow when you slip in your temper; when you have thoughts that are impure," he said. "Every Muslim has something to work on. Ramadan is the month of mercy, the month of forgiveness." As he finished his sermon, the group stood and packed in closer to the front for the closing prayer. One man sang out in Arabic, and the others hummed back in response. The prayer finished when the crowd members turned their heads from one side to the other and a man grabbed the microphone to make a few announcements. He encouraged them to participate in the food drive for the homeless shelter and reminded the group that voter registration deadlines were approaching. Finally, he announced that a sheet of paper would be in the lobby for any boys interested in this season's basketball league. "All boys 15 and up can sign up if you're interested," he said. Contact staff writer Emmett Gienapp at egienapp@timesfreepress.com or 423-757-6731.